Sadie, Silvia, Polly, and Peppy are our backyard chickens, and they keep us well supplied with fresh eggs! I am always dreaming up creative ways to use the eggs, and I recently saw a picture which inspired this easy dish my whole family adored. The recipe is very loose. 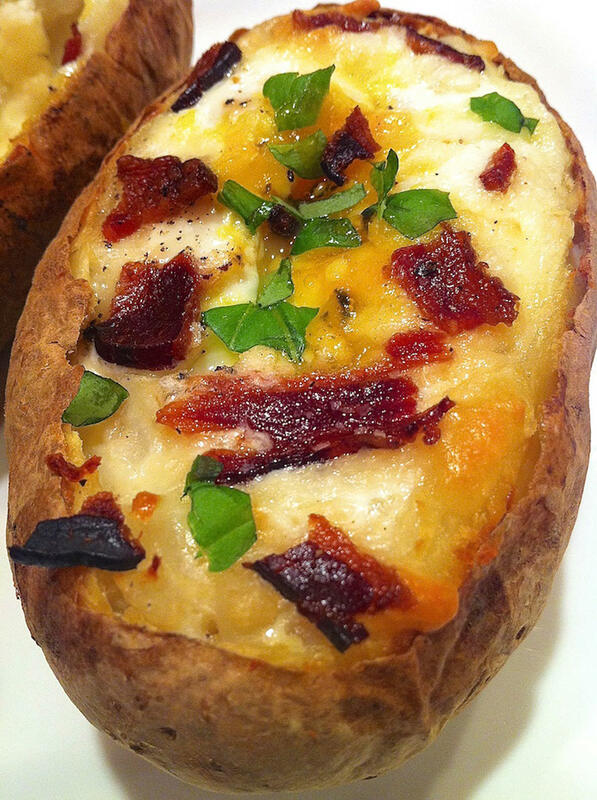 Basically, you bake an egg in a hollowed-out baked potato. I used cheddar cheese and a sprinkling of bacon, but prosciutto and parmesan or ham and mozzarella are two other good combinations. Sauteed pancetta and asiago?? Choose your favorites. A little bit of cheese and meat goes a long way, making this a healthy, satisfying, and affordable meal. To get extra mileage out of this dinner, save the top of the potatoes and the remaining scooped-out insides. I have two ideas for speedy dinners another night: potato skins using the cut-off tops and salmon cakes with the scooped-out insides (yes, my sister-in-law makes a terrific dish using leftover potatoes in a salmon cake!). Also, make sure to read the hint at the bottom of the recipe for a simple way to make this meal even more amazing! Click here for the recipe for Potato Chive Salmon Cakes and here for Easy Baked Potato Skins. Cutting horizontally, remove the top quarter of the potato and reserve for another use. Scoop out the insides to make a “bowl” just big enough for your egg. Carefully, crack the egg into the potato, keeping the yolk in tact. Top with cheese and bacon. Place on a baking sheet and bake at 350 degrees for about 20 minutes. Cooking times may vary a little depending on your oven and how you like your egg, so keep an eye on it towards the end. I like my eggs whites firm but the yolk runny and 20 minutes was perfect. I like to scoop out almost all of the insides of the baked potato, mash with a dollop or two of Chobani 2% plain yogurt (as a healthy substitution for sour cream–a glug of milk works well, too), a drizzle of olive oil, and salt and pepper to taste. Then put enough of these quickie mashed potatoes back in to create the right size “bowl” for your egg. Now you have a layer of good-for-you mashed potatoes under the egg. When you take the potato out of the oven, stir it all up. The yolk makes a tasty sauce and every bite will be heavenly! I could eat these every night! I love eggs and baked potatoes. Now I can have them together. What a great idea! This combination is so basic yet so good! I hope you enjoy, Margo! Since I am too impatient to wait for an hour while the potatoes oven-bake and I used the last Idahos over the weekend, I am trying this with a big red potato micro-baked, then I will revert to oven for the egg part-what a great brunch. yum. I know what you mean, Carol…when I am hungry, waiting an hour can seem like an eternity! I hope you enjoyed! Hello, this is such a great recipe..and easy. I loved it! I love this for an easy dinner, too. So glad you liked! I stumbled upon your blog recently and I’ve truly loved surfing around your site. I made this recipe and really liked it. Had everything on hand and it’s completely delicious and so satisfying. Parmesan crusted salmon is next on my list! I, too, am glad you found my site as well as a recipe you enjoy. That salmon recipe is an old favorite here, for sure! Thanks, Del. Hope you like! Awesome! My family loved this and we will be having it on our dinner menu often. Another one of your keeper recipes… you did it again!